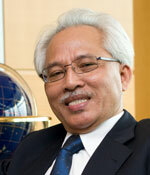 Professor Dato' Dr. Muhamad Rasat Muhamad was appointed President of Multimedia University in 2011. Previously, he worked at Universiti Malaya heading several departments, viz. Chairman of the Advanced Fundamental Research Cluster (2009-2010), Deputy Vice Chancellor in Research& Innovation (2006-2008), Director of the Institute of Research Management and Consultancy (2001-2005), Dean of the Faculty of Science (1991-2000). He has many years' experience as a physics lecturer and tutor. He is a Fellow of the Malaysian Academy of Science (FASc), Malaysian Institute of Physics (FIPM) and Malaysian Association of Solid State Science and Technology(MASS). He is also a member of the Institute of Electrical and Electronic Engineer (MIEEE) USA. Among his achievements are the Public Services Department Scholarship for BSc Program (UKM) and PhD (University of Durham), the Commonwealth Academic Staff Fellowship at Electrical Engineering, visiting scholar at the University of Cambridge, England (1987/88), fellowship at the Physical Electronic Department of the Asian Development Bank, and visiting scientist at the Tokyo Institute of Technology (1993). Professor Dato' Dr. Muhamad Rasat Muhamad received the Excellence Services Award from the University of Malaya in the years 1993, 1995, 1998, 2000, 2001, 2002, 2005 and 2006. He was also conferred the title Darjah Dato' Paduka Mahkota Perak (DPMP) by His Majesty DYMM The Sultan of Perak (2008) and Pingat Johan Mangku Negara (JMN) Award by His Majesty DYMM Yang diPertuan Agong (2007).